You are here: Home » District 13 remade as Brick Mansions? District 13 remade as Brick Mansions? When I first read the synopsis of the film I got struck by a large amount of deja vu. It reminded me of a 2004 film, District 13. Produced by Luc Besson. To make it even more alike, even the stills are reminiscent of the original. It seems that Luc has run out of ideas so he’s just recycling his French language catalogue that hasn’t had a US remake and doing a search and replace for French town and some French names and replacing them with American ones. Paris for Detroit. District 13 for Brick Mansions. Then you have the American remake. Simples! It makes a nice change for a large studio to remake a foreign language film and not just re-imagine / reboot a dying franchise such as The Fast and the Furious. I’ll let you decide which is the better. The French original or the US remake. Basically, it’s got 1/2 of the originals main cast in it, the same writer & producer so don’t expect much more than the original. The trailer for the original gives away more of the plot and shows more of the action but apart from that you can spot exact duplicates of scenes between the two. We have also been sent a set of images for the film. Just have a look at the gallery. In a dystopian Detroit, abandoned brick mansions left from better times now house only the most dangerous criminals. Unable to control the crime, the police constructed a colossal containment wall around this area to protect the rest of the city. For undercover cop Damien Collier (Paul Walker) every day is a battle against corruption. For Lino (David Belle), every day is a fight to live an honest life. Their paths never should have crossed, but when drug kingpin, Tremaine (RZA) kidnaps Lino’s girlfriend, Damien reluctantly accepts the help of the fearless ex-convict, and together they must stop a sinister plot to devastate the entire city. 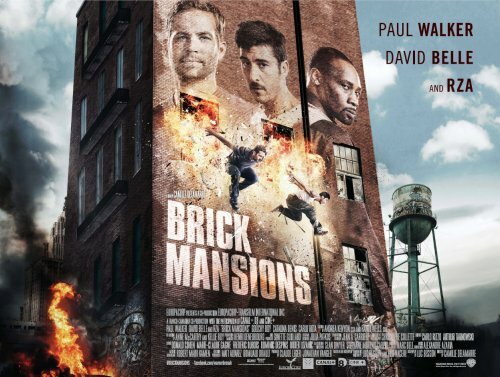 With stylized action featuring thrilling Parkour stunts (David Belle is the co-founder of this physical training discipline), “Brick Mansions” puts an entertaining twist on the action genre. Point Break – the remake!